Here is an excellent resource on why philosophy degrees make especially smart and successful businessmen and women, lawyers, journalists, etc. (you are actually dramatically better off doing a first degree in philosophy than business administration for a career in business). Some very good answers to "Philosophy? What are you going to do with that?" question. Go here for "testimonials". Includes GRE test performance (philosophers do staggeringly well - look right), comparative salary information, and various other useful bits of evidence that collectively puncture the peculiar modern myth that philosophy isn't "useful". 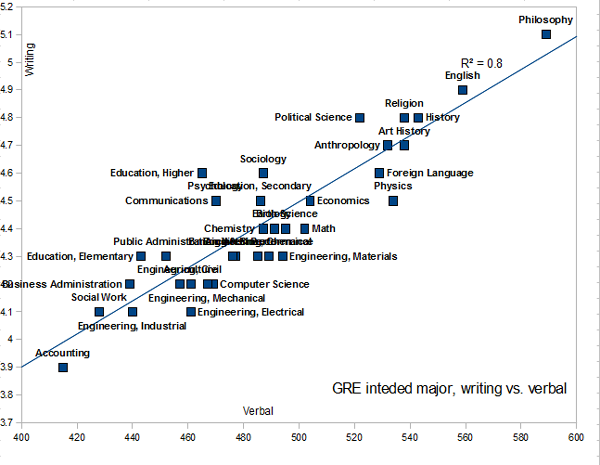 I previously commented on the GRE scores comparing philosophy students with all other students here. "In addition, as the marketplace becomes more competitive, graduate degrees become more desirable, and that entails a strong performance on the Graduate Management Admission Test (GMAT), the exam most business schools require their applicants to take. Philosophy majors consistently outperform other majors on the GMAT, including all business majors, all humanities majors, and all social sciences majors. Philosophy majors enjoy enormous advantages going into business." "Most of management theory is inane, writes our correspondent, the founder of consulting firm. If you want to succeed in business, don’t get an M.B.A. Study philosophy instead." You do know what Dr Glenn Peoples does for a living ? Thanks for this article. I completed an Honours degree in Philosophy in London in 97, then went home to Australia, fought several successful community campaigns, and was elected as a Greens local government councillor in 2004. Philosophy allowed me to see through obfuscation and gave me the confidence to be able to listen effectively and successfully argue my corner. Are you suggesting a causal relationship here? That choosing to do philosophy will lead to greater success? The evidence from the chart is that philosophers have good (English) language skills. It might be that philosophers tend to be chosen from the pool of people who have good language skills, or it might be that a philosophy degree will improve your language skills. We can't tell. The other skill that I think is critical is mathematical skills. I know a few philosophy graduates and they are all good at maths. It would not surprise me if that were generally true. I certainly agree that philosophy grads make very good employees but I suspect that it's because the subject acts as a filter: the average business major would flunk philosophy early on. 1) What typo are you referring to? 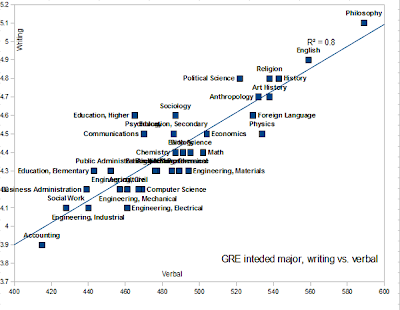 2) I'm nearly certain this is a graph prepped by the administs of the GRE, and not simply some philosopher trying to make the discipline look good. I certainly agree that philosophy grads make very good employees!